Home A: News Continuity in Pocopson for 2012; worries about post office? Continuity in Pocopson for 2012; worries about post office? 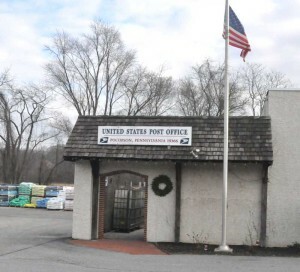 Pocopson Township Supervisors expressed concerns Tuesday that the township's Post Office could be on the chopping block when a series of office closures is announced in May. POCOPSON — The more things change the more they stay the same. Those circumstances held true during Monday night’s Pocopson Township Reorganization Meeting where Supervisor Steve Conary was again elected Supervisor’s Chair and Supervisor Georgia Brutscher as Vice Chair. Newly elected Supervisor Ricki Stumpo was unable to attend her first meeting due to illness. Richard Jensen, Township Code Enforcement Officer, was appointed as Pocopson’s Fire Marshall for a year-long term. Supervisors also voted to submit Jensen’s name to the Governor for approval as the township Emergency Management Coordinator. Supervisors’ Vice Chair, Brutscher, presented five properties for approval under the Township’s Agriculture Security District – totaling almost 150 acres. Brutscher is a member of the committee which actively seeks landowners to participate in the program and said committee members will be “knocking on doors” once the days get longer. She explained that the program, “gives farmers relief from nuisance complaints regarding noise, smells and insects that are all part of a working farm.” Last night’s approval is just the first step in the process. The proposal now goes to the Chester County Planning Commission, then back to the township for a public hearing and then on to the County Planning Commission again for final approval…taking up to 180 days in all to complete.